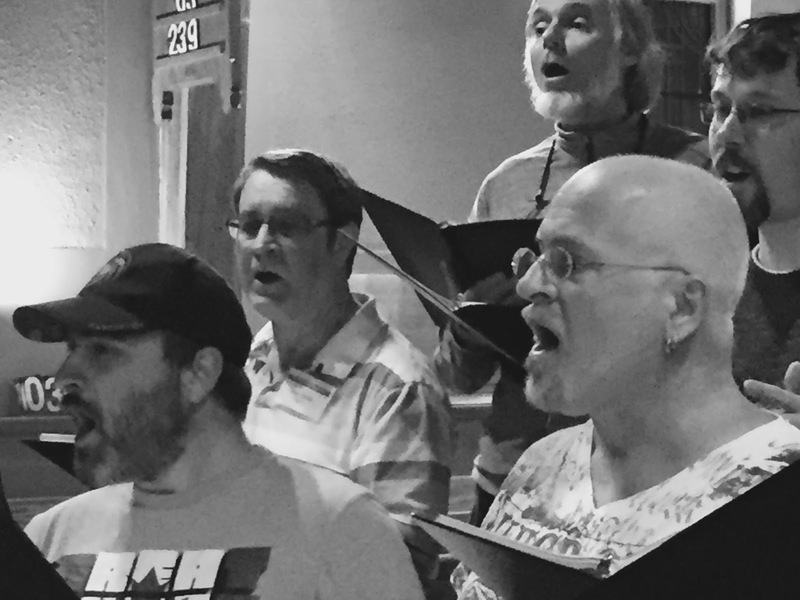 Canada's bilingual, award-winning acappella chamber choir. En Français - Les Chanteurs Stairwell, Ottawa, Ontario. Auditions twice a year. I have dedicated this piece to my late mother, Lois Rain, as it was on her CD of medieval three-part songs that I first came across this little gem. My arrangement of this rhythmically exciting piece is for four parts, and includes an introduction, a mini-fugue verse, and a rousing coda to finish the piece. As a singer myself, I wanted to ensure that everyone had some sections that they could really dig into. I shone a special spotlight on my alto buddies, who open the piece low in their register, but with great power, accompanied by the tenors. Then the basses come in with a strong rhythmic accent and the first verse comes to an end. The sopranos then get the spotlight in verse two as they soar upwards angelically (singing literally about the Angel Gabriel) with the altos and tenors accompanying them. Verse three features the men, initially in a low monkish register, but again soaring upwards towards the end of their section. Verse four is the fugue, with the initial spotlight on the basses, who get to sing the full melody from beginning to end. To date, this has been the most difficult section of music that I have written, amongst my 30+ compositions. A tiny passage of music, yet with all four parts exploring the basic “In natali” theme, how challenging to get it just right. After many attempts, I realized there was the possibility of having the two women’s parts play off each other. And so, the altos again get to shine, as they leapfrog over the sopranos, but then the sopranos respond and move above the altos, then it’s the altos, then the sopranos, and so on. The effect I was aiming for was to create a feeling of reaching upwards, a longing to climb that elusive stairway to heaven, so to speak. It’s a challenging section, this fugue, and our director Pierre Massie has worked us really hard to pull it all together. I’m so thankful that he’s bringing this new musical creation to life and acknowledge his many compositional suggestions during the gestation period too. It’s just one small piece in the midst of a very exciting, diverse concert program for our 40th anniversary finale. To our loyal blog readers, I do hope you can make it, you won’t be disappointed. You can also email your questions to me - info (at) stairwellcarollers (dot) com. St. Columba Concert Tonight is SOLD OUT! Thanks to all who auditioned - our 2019 choir rehearsals have begun! A Baby is Born / L’Enfant est né - Pierre Massie, composer - YouTube Premiere! Eya, eya, gaudeamus - P. Massie - Choral Workshop with Gabriel Lewis-O'Connor - sign up now! Don't miss a post! - Subscribe now! SC Best in Ontario OMFA 2013 !! Pierre Massie wins OCDSB Arts Award! 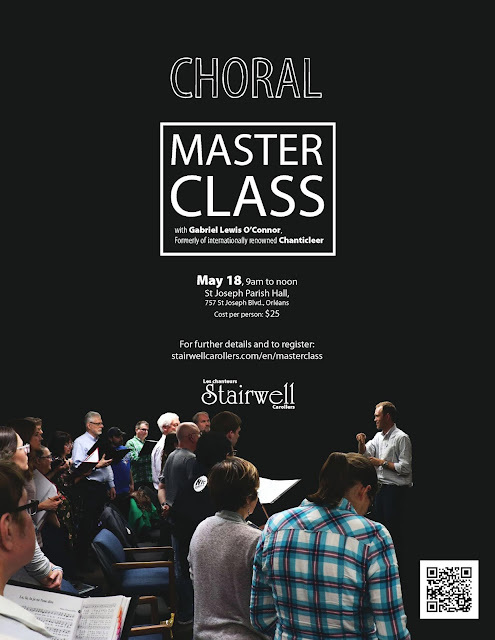 Ottawa Choral Masterclass with Gabriel Lewis-O'Connor - Limited enrolment, BOOK NOW! All rights reserved, Holly Massie for The Stairwell Carollers. All photos property of Holly Massie. Powered by Blogger.